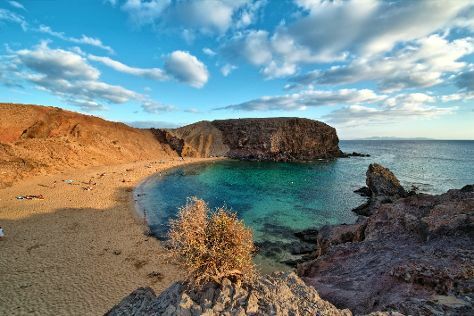 Step off the beaten path and head to Timanfaya National Park and Playa del papagayo. Get out of town with these interesting Lanzarote side-trips: Esennia (in Puerto Del Carmen), Corralejo (Parque Natural de Corralejo, Scuba & Snorkeling, & more), Casa / Museo Cesar Manrique (in Haria) and Puerto deportivo Marina Rubicon (in Playa Blanca). There's lots more to do: Head underground at Los Hervideros, stop by Queseria El Faro, take in the exciting artwork at Angel Cabrera, and get in on the family fun at Rancho Texas Lanzarote Park. To see where to stay, reviews, and tourist information, refer to the Lanzarote trip planner. Orlando, USA to Lanzarote is an approximately 18.5-hour combination of car and flight. Traveling from Orlando to Lanzarote, you'll lose 5 hours due to the time zone difference. Traveling from Orlando in June, expect Lanzarote to be slightly colder, temps between 81°F and 67°F. Wrap up your sightseeing by early afternoon on the 12th (Mon) to allow enough time to travel to Maspalomas. You'll explore the less-touristy side of things at Scuba & Snorkeling and Playa de Amadores. Step out of Maspalomas to go to Las Palmas de Gran Canaria and see Playa de Las Canteras, which is approximately 48 minutes away. 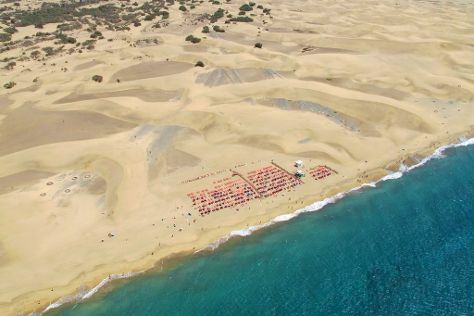 The adventure continues: enjoy the sand and surf at Playa de Maspalomas, stroll through Playa de Mogan, glide through the air with a parasailing or paragliding tour, and relax and rejuvenate at some of the top local wellness centers. To see reviews, more things to do, traveler tips, and tourist information, read Maspalomas travel itinerary creator. Getting from Lanzarote to Maspalomas by combination of bus and flight takes about 4 hours. Other options: do a combination of car and ferry. In June, daily temperatures in Maspalomas can reach 78°F, while at night they dip to 67°F. Finish up your sightseeing early on the 20th (Tue) so you can travel to Barcelona. Explore hidden gems such as El Barri Gòtic and Camp Nou. There's lots more to do: admire the landmark architecture of La Sagrada Familia, examine the collection at Casa Milà, pause for some serene contemplation at Barcelona Cathedral, and ponder the design of Magic Fountain (Font Magica). To see more things to do, photos, other places to visit, and tourist information, go to the Barcelona vacation builder. You can do a combination of bus, flight, and train from Maspalomas to Barcelona in 6 hours. Another option is to do a combination of bus, taxi, ferry, and train. Due to the time zone difference, you'll lose 1 hour traveling from Maspalomas to Barcelona. In June, plan for daily highs up to 78°F, and evening lows to 66°F. Wrap up your sightseeing by early afternoon on the 24th (Sat) to allow time for travel to Dubrovnik. Eschew the tourist crowds and head to Gradske Zidine and Cavtat Old Town. The adventure continues: take a stroll through Old Town, add some adventure to your tour with a kayaking and canoeing tour, make a trip to Dubrovnik Cable Car, and head off the coast to Island of Lokrum. To see maps, more things to do, photos, and tourist information, read Dubrovnik trip itinerary planner. You can do a combination of train, flight, and bus from Barcelona to Dubrovnik in 5.5 hours. Alternatively, you can drive; or do a combination of train, bus, and ferry. Expect a daytime high around 79°F in June, and nighttime lows around 66°F. Finish your sightseeing early on the 1st (Sat) to allow enough time to drive to Split. Step off the beaten path and head to Dubovica and Diocletian's Palace. Step out of Split with an excursion to Trogir Square in Trogir--about 42 minutes away. Spend the 1st (Sat) wandering through the wild on a nature and wildlife tour. And it doesn't end there: add some adventure to your tour with a kayaking and canoeing tour, make a trip to The Peristyle of Diocletian's Palace, contemplate in the serene atmosphere at Cathedral and Bell Tower of St. Domnius, and stop by Filigran Split. For photos, maps, traveler tips, and tourist information, read Split holiday planner. Drive from Dubrovnik to Split in 3.5 hours. Alternatively, you can take a bus; or ride a ferry. In July, daily temperatures in Split can reach 88°F, while at night they dip to 69°F. Wrap up your sightseeing by early afternoon on the 5th (Wed) to allow time for travel to Vienna. Kick off your visit on the 6th (Thu): admire the natural beauty at Schoenbrunn Palace and then take in the architecture and atmosphere at St. Stephen's Cathedral. On the 7th (Fri), you'll have a packed day of sightseeing: admire the masterpieces at Belvedere Palace and then make a trip to Stephansplatz. For maps, photos, more things to do, and tourist information, read our Vienna vacation planner. Traveling by combination of bus, flight, and train from Split to Vienna takes 5 hours. Alternatively, you can drive; or do a combination of shuttle and train. Traveling from Split in July, things will get little chillier in Vienna: highs are around 80°F and lows about 60°F. Finish your sightseeing early on the 7th (Fri) so you can travel to Prague. Start off your visit on the 8th (Sat): make a trip to Charles Bridge, then contemplate the long history of Old Town Square, and then get to know the fascinating history of Prague Castle. To see ratings, traveler tips, more things to do, and other tourist information, refer to the Prague trip itinerary planner. Traveling by combination of train, flight, and bus from Vienna to Prague takes 3 hours. Alternatively, you can drive; or take a bus. In July, plan for daily highs up to 79°F, and evening lows to 60°F. Cap off your sightseeing on the 9th (Sun) early enough to travel to Rome. On the 9th (Sun), pause for some photo ops at La Pieta, then examine the collection at St. Peter's Basilica, and then ponder the design of Trevi Fountain. Get ready for a full day of sightseeing on the 10th (Mon): explore the ancient world of Colosseum, delve into the distant past at Palatine Hill, then appreciate the extensive heritage of Piazza Navona, and finally admire the landmark architecture of Pantheon. To find photos, other places to visit, and tourist information, refer to the Rome vacation planner. You can do a combination of bus, flight, and train from Prague to Rome in 5 hours. Other options are to drive; or take a train. Plan for a bit warmer temperatures traveling from Prague in July, with highs in Rome at 88°F and lows at 69°F. Finish your sightseeing early on the 11th (Tue) so you can take a train to Florence. Step off the beaten path and head to Piazzale Michelangelo and Uffizi Gallery. Change things up with these side-trips from Florence: Siena (Siena Cathedral & Piazza del Campo) and Torre di Pisa (in Pisa). There's lots more to do: see the interesting displays at Galleria dell'Accademia, let your taste buds guide you at a local gastronomic tour, admire the striking features of Abbazia di San Miniato al Monte, and get to know the fascinating history of Piazza della Signoria. To find reviews, other places to visit, photos, and more tourist information, read our Florence trip itinerary planner. Getting from Rome to Florence by train takes about 2 hours. Other options: drive; or do a combination of train, flight, and bus. Expect a daytime high around 89°F in July, and nighttime lows around 65°F. Cap off your sightseeing on the 14th (Fri) early enough to catch the train to Venice. Kick off your visit on the 15th (Sat): take in the views from Ponte di Rialto, then explore the activities along Canal Grande, then admire the striking features of Doges' Palace, and finally pause for some serene contemplation at St. Mary of the Friars. To find maps, reviews, ratings, and more tourist information, you can read our Venice trip planner. You can take a train from Florence to Venice in 2.5 hours. Alternatively, you can drive; or do a combination of bus and flight. When traveling from Florence in July, plan for little chillier days in Venice, with highs around 83°F, while nights are about the same with lows around 68°F. Finish up your sightseeing early on the 16th (Sun) so you can travel to Zermatt. Eschew the tourist crowds and head to The Matterhorn and Trümmelbachfälle. You'll find plenty of places to visit near Zermatt: Lauterbrunnen Valley Waterfalls (in Lauterbrunnen), Parasailing & Paragliding (in Interlaken) and Schilthorn - Piz Gloria (in Murren). And it doesn't end there: take in panoramic vistas at Sunnegga, have fun at Clay Shoot Zermatt, examine the collection at Matterhorn Museum, and fly down the slopes at Matterhorn Ski Paradise. 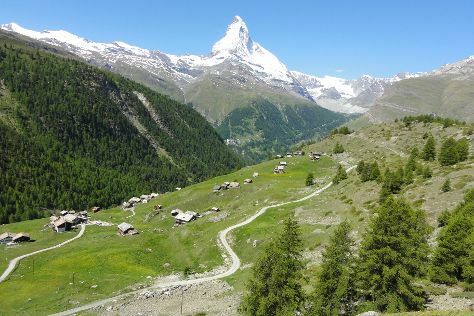 For reviews, ratings, traveler tips, and more tourist information, read Zermatt travel itinerary creator. You can take a train from Venice to Zermatt in 7 hours. Other options are to do a combination of bus, flight, and train; or do a combination of bus and train. Finish your sightseeing early on the 21st (Fri) to allow enough time to travel to Paris. 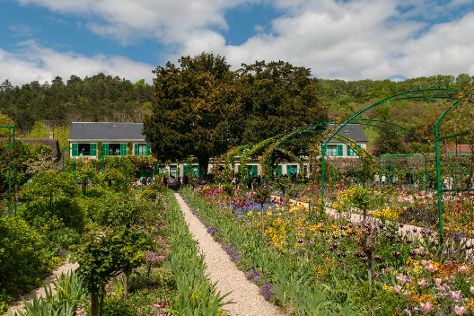 Step out of Paris to go to Giverny and see Fondation Claude Monet, which is approximately 1:25 hours away. There's much more to do: take in panoramic vistas at Eiffel Tower, admire the striking features of Cathédrale Notre-Dame de Paris, admire the masterpieces at Louvre Museum, and take in nature's colorful creations at Luxembourg Gardens. To see photos, traveler tips, where to stay, and tourist information, read our Paris trip builder. You can take a train from Zermatt to Paris in 7 hours. Alternatively, you can do a combination of train and flight; or do a combination of train and bus. In July in Paris, expect temperatures between 77°F during the day and 58°F at night. Finish your sightseeing early on the 24th (Mon) so you can travel to Bonifacio. 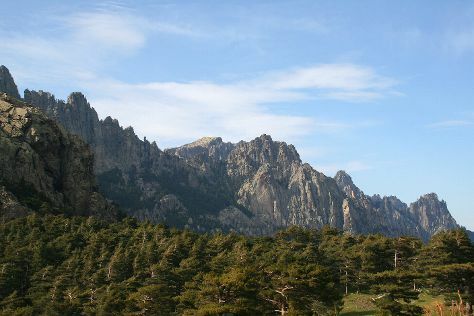 Explore hidden gems such as Plage de San Giovanni and Aiguilles de Bavella (Bavella Needles). You'll find plenty of places to visit near Bonifacio: Piscines Naturelles de Cavu (in Sainte Lucie De Porto Vecchio) and Plage de Saint-Cyprien (in Lecci). And it doesn't end there: take a peaceful walk through Foret d'Aitone, explore the fascinating underground world of Grotte di Bonifacio, contemplate the long history of Bonifacio Citadel, and kick back and relax at Santa Giulia Beach. For other places to visit, ratings, where to stay, and more tourist information, refer to the Bonifacio tour planner. Traveling by combination of train, flight, and taxi from Paris to Bonifacio takes 3.5 hours. Alternatively, you can do a combination of train, ferry, and bus; or do a combination of bus, train, and ferry. Traveling from Paris in July, you will find days in Bonifacio are a bit warmer (88°F), and nights are about the same (63°F). Wrap up your sightseeing on the 1st (Tue) early enough to travel back home.